Scuba diving in Tobago is a brilliant experience. Framed by the Orinoco River, southern Atlantic Ocean and Caribbean Sea, Tobago’s waters contain a striking abundance of sea life. 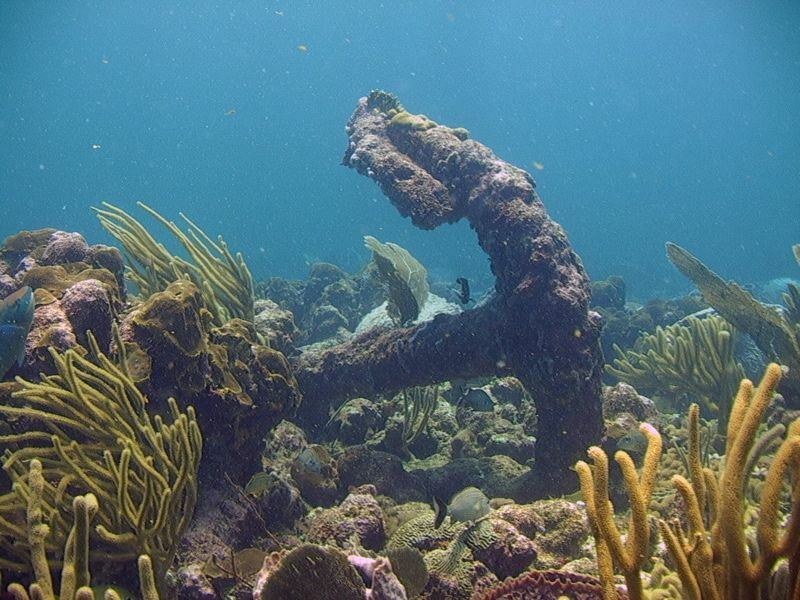 Diving draws many visitors to Tobago and Speyside is the island’s diving mecca. Premier sites like Angel Reef, Black Jack Hole, Kelleston Drain, Coral Gardens and Japanese Gardens lie just offshore.You can dive in a shallow reef or deep water, witnessing small and large sea creatures in their natural habitat. Home to the world’s largest brain coral, sharks, sea turtles and exotic tropical fish, although the biggest attraction is the magnificent manta ray, with an average 2—4m (8—12ft) wingspan. Tobago’s underwater paradise is a must-see for diving enthusiasts. Scuba diving in Tobago is growing in popularity, attracting increasing numbers of adventurers from Europe and North America each year. An awesome eroded arch which can be swum through when conditions are good only. It’s not for the faint-hearted since it’s only 8 metres deep and 4 metres wide with huge surf, but well worth the effort since there are turtles, green morays and huge parrotfish living in the zone. The wall around the island is totally pristine with amazing colours & a vibrant fish life. Everything from large schools of tuna to nudibranchs. A coral bommie just breaking the waterline with a depth of 40(plus) metres and a phenomenal wall drop-off. All Aquatic species congregate here to hunt. It’s an awesome spot with couloirs, narrow gullies, swim-throughs and an abundance of larger Pelagics. Known locally for the large schools of scalloped and great hammerhead sharks, these 5 rocks are more than worthy of 2 dives – the outer edges being darker, more wild and more dramatic with sheer walls and larger marine critters whilst the inner sites are prettier with less current, more colours and usually smaller species. Leatherback turtles have been spotted here too amongst the largest crab I have ever seen and humongous lobsters! Sister’s Rocks offers great drift dives for the adventurous divers. It’s so hard to recommend just a a few. You ideally need a week diving just to touch the surface since we are truly blessed at this end of Tobago with average visibility at 25 metres and the choice of the 2 oceans. Night dives are also a speciality of mine – with the annual coral spawning being a real high point. Dolphins usually accompany our dedicated dive boat – “True Blue” – to the sites & giant manta are seen virtually daily from March to September. Leatherback & hawksbill turtles lay and hatch right on our beaches. We really are spoiled rotten. Come see for yourself! Article written by Caroline at Charlotteville Shark Shacks.